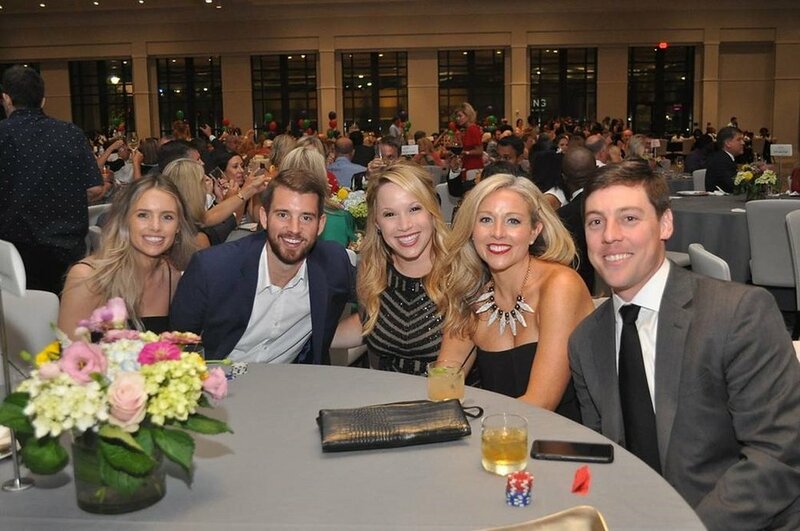 Mark Beal joined the Cobb County Chamber of Commerce’s Young Professionals group to participate in Reality U. 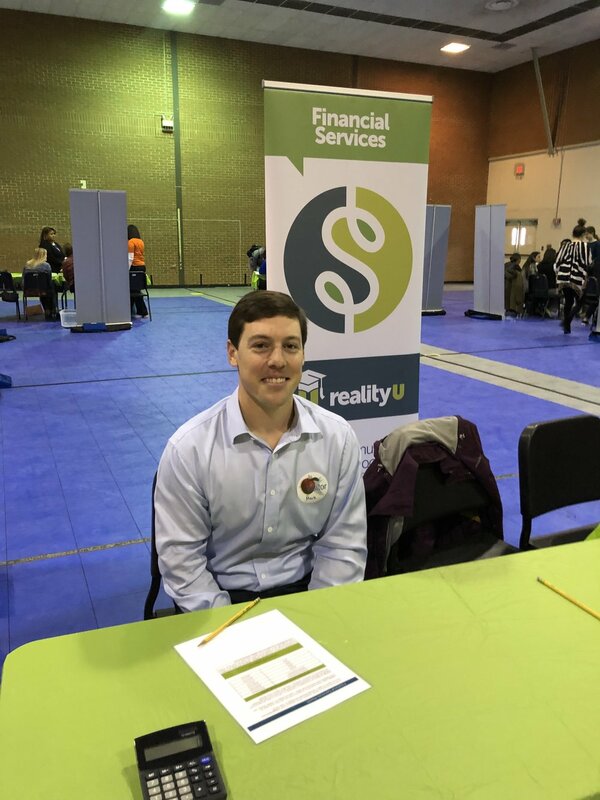 Here, he worked with 8th graders at McCleskey Middle School to help them understand the importance of establishing monthly savings goals for retirement plans and emergency funds. Students also learned how paying down debt for student loans and credit cards impact their monthly budget. Reality U seeks to promote financial literacy by teaching teens that their performance in school today can affect their future, provide students with the opportunity to learn and practice personal finance skills, and mobilize the community to become involved stakeholders in education, particularly financial literacy education in their local schools. Baer Wealth recently hosted an event called “Going Pro” with Moulaye Niang as guest presenter. Moulaye was born in a small town in Senegal, West Africa and came to the United States to play basketball at the age of 16 without knowing a word of English. His story took audience members through his journey as a young boy in Africa with no shoes, to playing in the NCAA Championship, to working at Dimensional with some of the top advisors in the country. He took guidance and good advice from many advocates along the way, and Moulaye highlighted that guidance while drawing parallels to the way he sees advisors and investors working together. Ultimately, he did not “go pro” in basketball, but showed that there are an infinite number of things you can “go pro” in in life. Everyone has their own unique journey and goals. In December, Baer Wealth “wrapped up” our 3rd annual toy drive benefiting Children's Restoration Network. Clients, friends and members of the community donated toys, and Baer matched that number. We are proud to have partnered with some amazing people to help make this happen and most, importantly, brighten the holidays for many kids in the local community! Just in time for school starting back, CRN hosted their 25th Birthday Celebration at The Hotel at Avalon. A special thanks to the many volunteers who made the night possible. Proceeds from the event will benefit CRN's HeadSmart Educational Programs, which provide New Hope Scholarships, new and filled book bags, and a wealth of educational support to the children. As part of the Management Education Series hosted by Sterling Seacrest Partners, Kenny Baer had the opportunity to speak to industry leaders and business owners alike. His discussion focused on harnessing the strategies of the super-rich in order to become seriously wealthy. Said Sterling Seacrest Partners, "It was a pleasure hosting Kenneth Baer, CFP(R) for a Lunch & Learn in our Management Education Series. Who doesn't want to learn the strategies used by the ultra-wealthy business owners? Thanks for sharing your wisdom with us, Kenneth!" If you would like to learn more about this series or have Baer Wealth Management speak at your next event, please reach out to us! Kenny Baer, managing partner of the Marietta-based wealth management firm Baer Wealth Management, has joined the Advisory Board of Directors of Children’s Restoration Network (CRN), a non-profit that offers support to children and their mothers to help them break the cycle of homelessness. Baer Wealth Management has supported CRN through a number of initiatives over the last five years, including two very successful toy drives that brought a little bit of holiday cheer to children in need in the Atlanta area. CRN helps to touch the lives of more than 6,500 homeless children and 1,100 homeless mothers living across 20 metro Atlanta counties each year by offering services to address the physical, emotional and academic needs of these children and their mothers. Baer joined Baer Wealth Management shortly after graduating from Elon University. With nearly 15 years in the wealth management and financial planning fields, he manages the company and creates individualized programs and solutions for each client’s unique financial situation. He also oversees the development and implementation of clients’ financial blueprints, offering big picture perspective and detailed recommendations with the goal of helping each client reach financial independence. In 2017, Baer published “One Shot,” an e-book that offers strategic and tactical advice for entrepreneurs and small business owners who are ready to sell the companies they founded. He has been published in Investment Advisor magazine, Nerd Wallet, Ignite/Fund Fire and Chattahoochee Plantation Living. His financial advice has been featured in the Marietta Daily Journal. He has also hosted the weekly financial talk show The Baer Facts on Newstalk 1160 AM, had a regularly scheduled segment on The Voice of the Arts on 1690 AM and has been a featured guest on Atlanta Business Today. Baer Wealth Management wrapped up its 2017 Toy Drive last month, benefiting Children's Restoration Network. Clients, friends and members of the community donated toys, and Baer matched that number for a total of nearly 300 toys donated that helped to brighten the holidays for very deserving kids. We are proud to have partnered with some amazing people to help make this happen! Last year's Baer Wealth Management Toy Drive to benefit Children's Restoration Network yielded a lot of toys and a lot of happy kids! Kenny Baer, Sr. Wealth Manager and Managing Partner is flanked by Mark Beal, Personal Wealth Advisor and Sandra Clausen, Client Services Manager. The 2017 Toy Drive is taking place now through Dec. 9, 2017. ATLANTA, GA. (Nov. 15, 2017) - Baer Wealth Management is hosting its second annual holiday toy drive benefiting the Children’s Restoration Network (CRN) from now until Saturday, Dec. 9. The Marietta-based investment advisory company invites the community to get involved this holiday season by donating new, unwrapped toys to provide special gifts for some of the 3,000 underserved children that CRN serves each day. Their goal is to collect 100 toys to deliver to children during the holiday season. For each toy donated, Baer has pledged to match it with a toy of their own with hopes of collecting 200 toys. Donations will be accepted in Baer Wealth Management's lobby located at 101 Village Pkwy NE, BLDG 1-200, Marietta, Ga. 30067. If you can’t make it by the office but live locally, Baer will come pick up the toys from you. If you wish to contribute but do not live locally, you can purchase your toy on your preferred online shopping site, and have it mailed directly to Baer Wealth Management - Attention: Holiday Toy Drive. We ask that all donated items be new and unwrapped. CRN is a non-profit agency that has served homeless children and mothers in Atlanta for more than 25 years. Through various programs CRN helps children receive basic necessities from food and school supplies to adult guidance and scholarships. Providing meaningful content to our clients, professional network of advisors, and prospective clients is important to us. That's why Kenny Baer launched One Shot in July 2017 as a way to speak directly to successful entrepreneurs. This e-book explores the right approach to preserving your wealth before, during, and after a liquidity event. You can access the book on our website and read it anywhere in the world! We hope you enjoy it! Baer Wealth Management participated in the 2017 Children’s Restoration Network (CRN) Golf Tournament on May 15th at the Laurel Springs Golf Club in Suwanee, Georgia . Our team (Tim O’Brien, Chris LaHay, Mark Beal, and Brett O’Brien) won 3rd place. The tournament raised funding for CRN’s HeadSmart Campaign which consists of multiple programs that provide academic and financial tools for homeless children in Atlanta. We are proud to support an organization like CRN that has been dedicated to serving our community for over 23 years! To learn more about CRN, visit its website: www.ChildRN.org. MARIETTA, GA (March 24, 2017) – Mark Beal, CFP®, Personal Wealth Advisor at Baer Wealth Management in Marietta, GA has been authorized by the Certified Financial Planner Board of Standards (CFP Board) to use the CERTIFIED FINANCIAL PLANNER™ and CFP® certification marks in accordance with CFP Board certification and renewal requirements. Mr. Beal has worked at Baer Wealth Management since 2015 and is responsible for matching investment and financial planning strategies to clients’ goals while helping professionals, families and business owners realize financial independence. CFP Board is a nonprofit certification organization with a mission to benefit the public by granting the CFP® certification and upholding it as the recognized standard of excellence for personal financial planning. CFP Board owns the certification marks CFP®, Certified Financial Planner™ and federally registered CFP (with plaque design) and CFP (with flame design) in the U.S., which it awards to individuals who successfully complete initial and ongoing certification requirements. CFP Board currently authorizes more than 76,000 individuals to use these marks in the United States. For more about CFP Board, visit www.CFP.net.